I should point something out though. Although it is perfectly acceptable to react to other people's actions from that same round (I mean if you see their posts above your own in the thread) the actual outcome of their actions will not be decided until the current round is over. Therefore, Bungo may not even succeed in making a sling, and Azriel never said anything about burning the sling he might have made, only creating fire that would be capable of burning it. I'll update tomorrow, or in 10 hours or so. Feel free to change your action if you like. Although conjuring a deckchair out of mid air with cocktails would be a perfectly fine action as well. I think we need a snack wagon, that sells oodles of chocolate, for when we get tired...or...halfway thru....or .....just cuz I cant say NO ! You manage to braid some long grass together, but cannot manage to make a sling out of them. You are left with several knotty lengths of grass-rope. Rubbing sticks together vigorously works excellently, but you somehow manage to set yourself aflame from the intense friction. Your hat is on fire! You feel a driving urge to produce alcohol. However, after rummaging about in your sporran, all you end up with is an empty bottle of Buckie and a distressingly sober outlook on life. Mrs. Figg: Conjure a deckchair complete with martini drink-holders. So complete is your faith in your conjuring powers (having read Harry Potter many times) that you sit back onto the chair you thought you just conjured, but your bustle finds nothing but thin air! You plop painfully down on the hard ground. Done. (I put you into the game-overview on the first and second page). I'll just plop in your stick-man in Round Two. Now what to do with my knotted grass... hmm. It is a free-form (no real rules apart from one or two, kind of like Forumshire!) forum game. The idea is that the moderator (me so far) puts up a scenario and anyone who wishes to join asks. 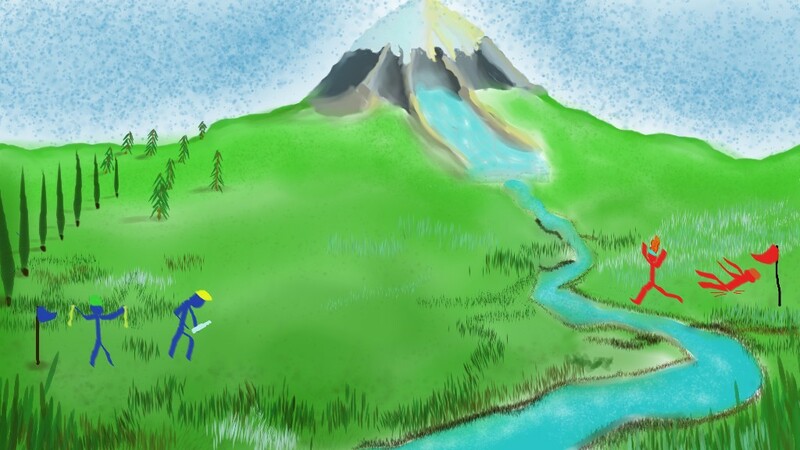 In this case I drew a picture of a landscape. Anyone who wants to play spawns as a stick-man. They then post an action, which I roll a die for (die, as in a single dice). If they get a low number the action fails horribly, if they get a higher number it succeeds (basically). I describe and draw (poorly) what has happened, and they react in the next round to what has taken place. It's basically a turn-based role-playing computer game, but instead of using a computer, we use a moderator. I take the inputs from the players and display what happens. I've never tried it before, but I think it'd probably be a lot of fun. I'm having a great time moderating so far anyway. Although I get a little impatient sometimes. If only people would post their actions in a timely manner! aaaaaaahaaaaaaaaaa.... we could do that here though. Indeed we could. In fact we are! I bloody hope thats me dashing towards the stream to put my head out ! Smash the end off the bottle to make a sharp weapon- any broken shards of glass get Bungo (he is on my team isn't he?) to use his grass string to bind it to a stick to make a spear. On the plus side I looked up "rammy" and now know what that means. Use burning hat to create furness to produce shields & weapons. It being a game - you'll need at least one fan... so I'm rooting for the Purists! I expect you to be on the side lines Orwell, in a nifty cheer leader outfit ! Mrs. Figg has until this afternoon (PST, in a few hours) to take her turn, I will update with or without her then. Who's the team that is the truist?